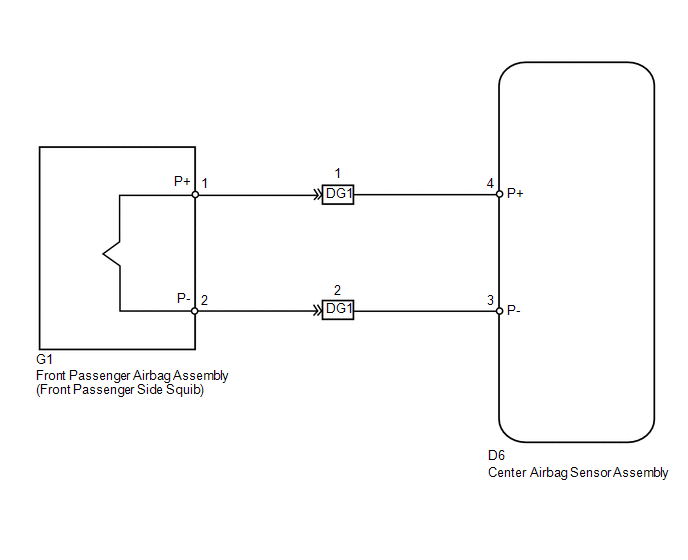 The front passenger side squib circuit consists of the center airbag sensor assembly and front passenger airbag assembly. These DTCs are stored when a malfunction is detected in the front passenger side squib circuit. The center airbag sensor assembly receives a line short circuit signal in the front passenger side squib circuit during primary check. The center airbag sensor assembly receives an open circuit signal in the front passenger side squib circuit. 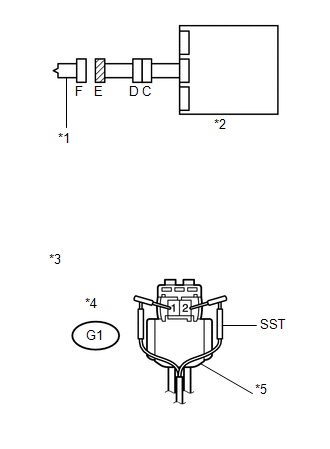 The center airbag sensor assembly receives a short circuit to ground signal in the front passenger side squib circuit. The center airbag sensor assembly receives a short circuit to B+ signal in the front passenger side squib circuit. (c) Check that the connectors are properly connected to the front passenger airbag assembly and center airbag sensor assembly. Also check that the connectors that link the instrument panel wire and instrument panel wire assembly are properly connected. (d) Disconnect the connectors from the front passenger airbag assembly and center airbag sensor assembly. Also disconnect the instrument panel wire from the instrument panel wire assembly. (f) Check that the instrument panel wire assembly connector (on the front passenger airbag assembly side) is not damaged. The lock button is not disengaged, or the claw of the lock is not deformed or damaged. (g) Check that the short springs for the instrument panel wire and instrument panel wire assembly with the activation prevention mechanism are not deformed or damaged. The short springs are not deformed or damaged. (a) Connect the instrument panel wire to the instrument panel wire assembly and center airbag sensor assembly. (b) Connect SST (resistance 2.1 Ω) to connector E (orange connector). Never connect an electrical tester to the front passenger airbag assembly (front passenger side squib) for measurement, as this may lead to a serious injury due to airbag deployment. 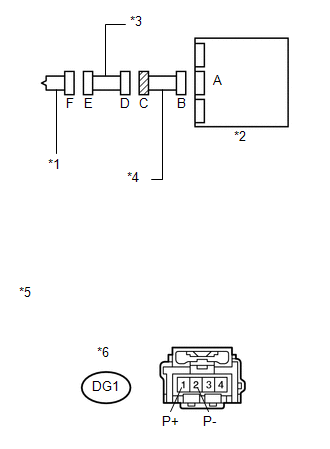 DTCs B1805, B1806, B1807, B1808 or 52 is not output. 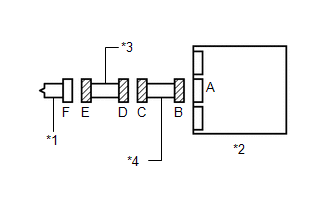 Codes other than DTCs B1805, B1806, B1807, B1808 and 52 may be output at this time, but they are not related to this check. 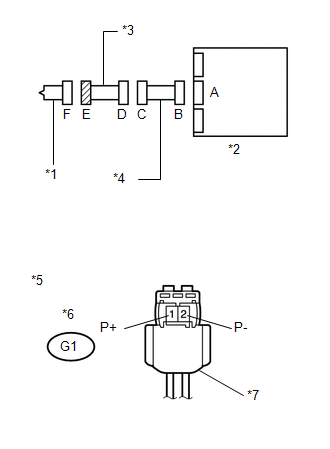 (c) Disconnect SST from connector E.
(i) Restore the released activation prevention mechanism of connector B to the original condition. (a) Connect the connectors to the front passenger airbag assembly and center airbag sensor assembly. (c) Turn the ignition switch to ON, and wait for at least 60 seconds. (d) Clear the DTCs stored in memory (See page ). (e) Turn the ignition switch off. (f) Turn the ignition switch to ON, and wait for at least 60 seconds. (g) Check for DTCs (See page ). DTC B1805, B1806, B1807, B1808 or 52 is not output. (a) Disconnect the instrument panel wire assembly from the instrument panel wire. (b) Check for a short to B+ in the circuit. (c) Check for an open in the circuit. (d) Check for a short to ground in the circuit. (e) Check for a short in the circuit. 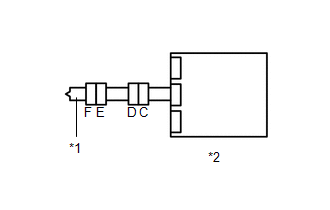 (a) Check for a short to B+ in the circuit. (b) Check for an open in the circuit. (c) Check for a short to ground in the circuit. (d) Check for a short in the circuit. 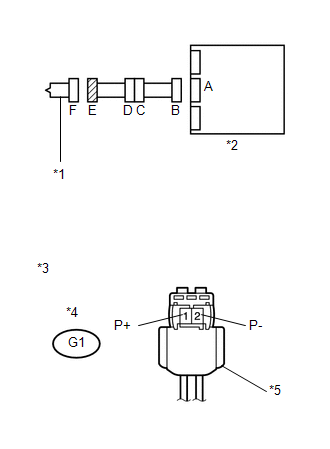 (1) Release the activation prevention mechanism built into connector D (See page ).